Susan MiHalo (center) shows historical map of location to educators and IISG’s Terri Hallesy (far left). Illinois-Indiana Sea Grant’s Terri Hallesy and Leslie Dorworth and I pulled up along the river’s edge and parked our car on the gravel road. As our group approached the bank, two majestic egrets took flight looking like purest snow against a backdrop of vibrant blues and green. A bald eagle had been spotted earlier, perched on a favorite branch of a dead cottonwood hanging over the river. 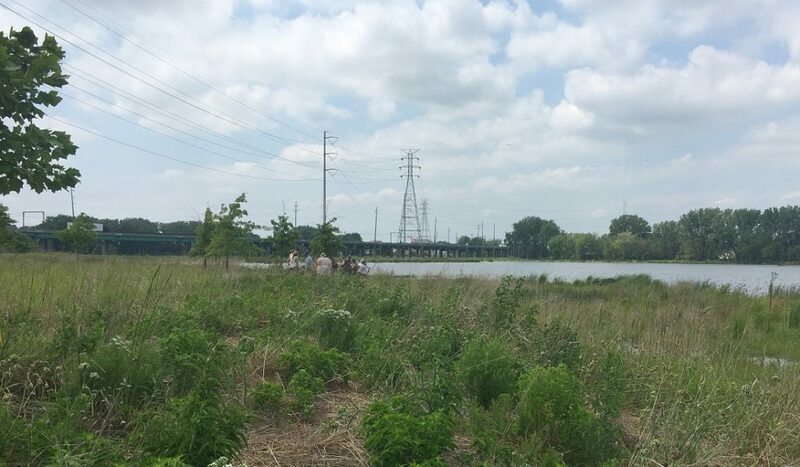 Educators tour Roxana Marsh, a 19-acre restoration site. It’s hard to believe that five years ago, a brown stand of the invasive species, Phragmites, had dominated the landscape where we were standing. The Grand Calumet River has made a radical transformation over the last 10 years thanks to the Great Lakes Legacy Act and many dedicated federal, state, and local partners. Our mission that day was to help 42 teachers from South Bend, Indiana understand just how large the ongoing transformation is, in hopes that they would carry this inspirational message back to their classrooms in the form of science labs, writing assignments, and other educational activities. We set out to accomplish this mission by hosting an IISG teacher workshop at Purdue University Northwest, Hammond campus in collaboration with The Nature Conservancy (TNC), the Indiana Department of Natural Resources (DNR), and the Indiana Department of Environmental Management (IDEM). 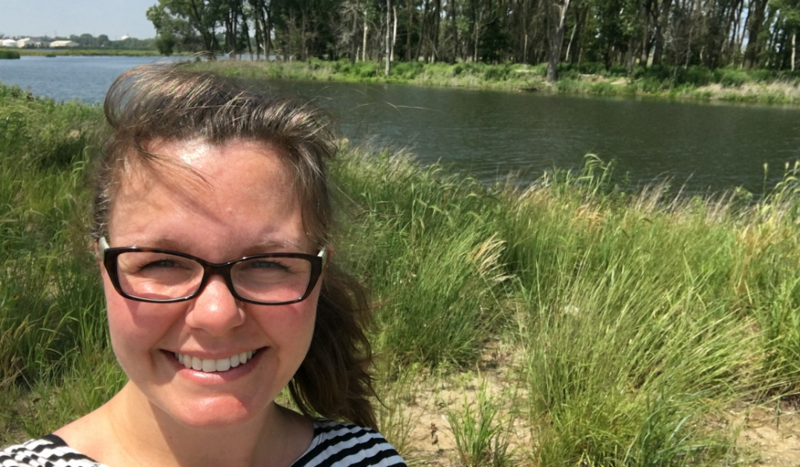 IISG’s Caitie Nigrelli stands in front of 58 acres of restored wetlands of the East Branch of the Grand Calumet River. Leslie and I have worked many years on the Grand Calumet River remediation and restoration and led the workshop. IISG assistant, Ben Wegleitner, played a coordinating role. 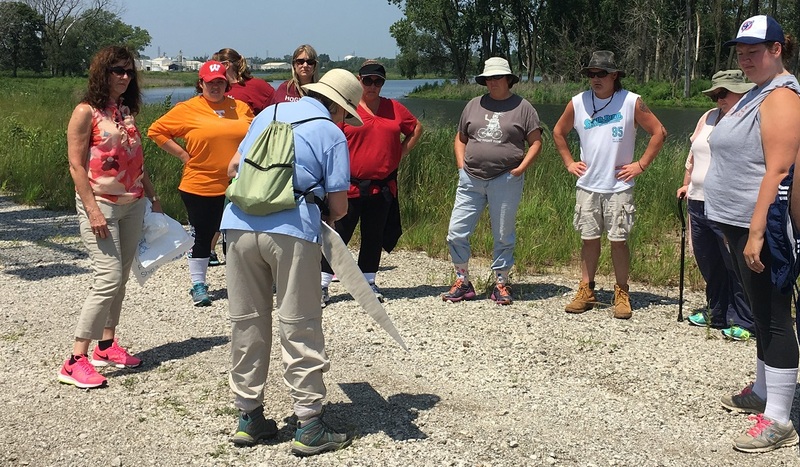 Working together, we brought in partners, Susan MiHalo (TNC), Carl Wodrich (DNR), and Anne Remek (IDEM), to talk about the Grand Calumet River and to host a tour of restored sites along the river. As IISG education coordinator, Terri demonstrated curricula and classroom activities as educators worked in groups, insuring its infusion into existing science curricula. She shared information about the issue of aquatic invasive species spread by sharing an innovative web site, Nab the Aquatic Invader! This engaging tool introduces students (grades 4-10) to marine and freshwater invasive species and their impacts using a detective theme and cartoon characters. Teachers also learned the environmental issue concerning improper release of classroom animals and plants and the threat they pose to the Great Lakes ecosystem through the campaigns, Habitattitude™ and Be a Hero-Transport Zero ™. Carl Wodrich (right), Indiana Department of Natural Resources, guides educators on a hike. Terri explained what she hoped to achieve that day—through direct experience with relevant education resources, these educators are now better equipped to explain how students can play an active role in helping to prevent the spread of AIS and foster a greater awareness of aquatic science. For classroom activities and curriculum ideas, visit IISG’s Education Products page. For information on the cleanup and restoration of the Grand Calumet River, visit www.greatlakesmud.org. Terri Hallesy and Leslie Dorworth also contributed to this article.